The dedicated silver Vello LH-61F Lens Hood is specifically designed for use with Olympus's M.ZUIKO Digital ED 75mm f/1.8 lens. It is primarily used to prevent unwanted stray light from entering the lens by extending and shading the end of it. A dedicated hood is crafted to perfectly suit the specific focal length of the lens it is designed for. Additionally, this hood features a non-glare matte finish on the interior surface to further prevent or limit lens flare. Also, since the end of the lens is extended, you get the added benefit of some extra protection from accidental impact. 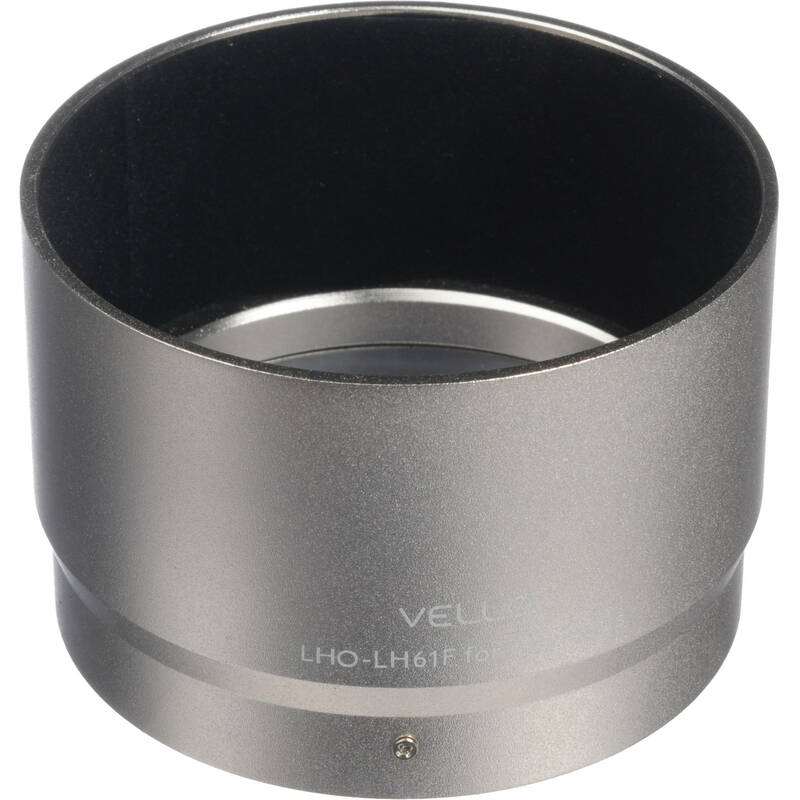 This silver, metal lens hood locks in place via a metal thumb screw and features a black felt interior for enhanced anti-reflection. Box Dimensions (LxWxH) 4.4 x 4.2 x 2.4"
LH-61F Dedicated Lens Hood (Silver) is rated 5.0 out of 5 by 7. Rated 5 out of 5 by jrosedds from Can't imagine the real one is any better This Vello lens hood matches the finish of the Oly 75/1.8 perfectly. It looks and feels well made. It stays put quite well, and I just leave it in place all the time. Due to its depth, it protects the lens element quite well. Hint: If you want to be able to place and remove a lens cap without removing the hood, I'd suggest buying an inexpensive Sensei center pinch 58mm cap from B&H. The Olympus cap with its side pinch design is virtually impossible to use with the hood in place unless you have inch long fingernails! Rated 5 out of 5 by Rick from Good alternative to Olympus I normally buy camera brand items for quality and compatibility. But Olympus' hood for the 75mm f1.8 lens is just too high. This hood works perfectly well, although I wish it were black. It makes filters just about impossible, but that's not the hood's fault - it just is. Rated 5 out of 5 by rufnkidding from Works Fine It Works. You save 40% from the cost of what should have been included by the lens manufacturer. No need to by OEM from Olympus. Rated 5 out of 5 by Jay from Nice Lens Hood for your 75mm f1.8 I don't see any difference with Olympus brand that costs $70. LH-61F works perfectly! Rated 5 out of 5 by Bob from Quality alternative For those who own the dekightful Olymous Zuiko 75 1.8 lens the Vello dedicated lens is a quality alternitive to the much more costly hood offered by Olympus. It's built well and fits right. Rated 5 out of 5 by Anne from Save your $$ instead of buying Olympus brand. Just like the title said. It's less expensive, made out of metal and fits perfectly on your lens. Rated 5 out of 5 by Limey from Olympus 75mm F1.8 hood Excellent fit, quality ,looks and especially the price !! Does the color match the silver Olympus 75mm f/1.8 lens exactly? In the photo shown it appears darker than the lens. The color of the hood matches almost exactly the color of the (silver) lens.